Last Friday was the end of my first week interning for the Justice Policy Institute, but I didn’t spend it at my computer. I spent the day outside the office helping to manage a press conference hosted by the Virginia Alliance Against Mass Incarceration, which then led to a rally. The topic of concern: giving voting rights back to formerly incarcerated people. That’s right: after doing time and serving their debt to society, some people in Virginia and three other states, including Kentucky, Iowa, and Florida, still do not automatically regain their voting rights or other civil rights, such as the right to hold public office, the right to purchase firearms, and the right to travel abroad. An overwhelming 350,000 Virginians have had their voting rights taken away as a result of committing a violent or nonviolent offense. Virginia Gov. Robert McDonnell took a step in the right direction last Wednesday by announcing a new policy allowing automatic rights restoration – but only to those who committed non-violent offenses As a result, there will still be thousands of Virginia residents who paid their dues, but still cannot automatically have voting rights simply because the offense committed was categorized as violent. Instead, they must wait five years after their release to apply to have their civil rights restored. 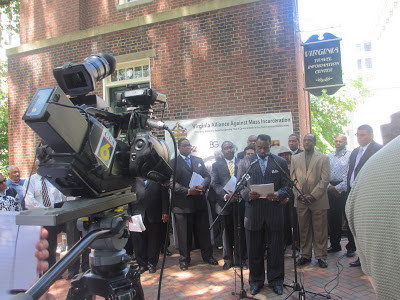 Faith-based communities streamed into the Virginia State House Courtyard Bell Tower in central Richmond a week ago to support the cause and hear faith leaders Reverends Mark A. Croston Sr., Darrell Keith White, Edward Hailes Jr., and Emory Berry, Jr. speak on behalf of the disenfranchised. They spoke powerfully, praising the governor for his step in the right direction, but also urging him to go all the way by allowing all formerly incarcerated people to regain their voting rights instead of some. “We still need a permanent solution for the thousands of Virginia citizens who remain disenfranchised,” said Rev. Hailes, also general counsel for the Advancement Project, as 50 supporters watched from the shade of the trees at the State House Bell Tower. Feeling the heat of the day and engulfed in the passion of the moment, many supporters responded to the speakers by shouting their approval. After enduring the hardships of prison life, it’s hard enough for formerly incarcerated people to reintegrate into society after their release. Making the process of regaining their voting rights so drawn out with a five-year waiting period just alienates them more. Imagine the shame of having to ask permission to vote again. The stigma is still strong and it’s time to push back. We did just that on Friday, with immense success. Take a look at the CBS6 feature news coverage that resulted as a result of the communications expertise of Advancement Project and JPI! Support the pledge calling on Gov. McDonnell to issue an executive order for automatic rights restoration at www.takebackmyvote.org. If you believe that you or someone you know has been impacted by felony disenfranchisement, call this toll-free 24-hour hotline: 1-855-LET-VOTE. To follow this issue in social media, use these hashtags: #VA #votingrights #right2vote #justice #civilrights #rights. Victoria is JPI’s communications intern.